The scene unfolds rather predictably whenever Dan Weyland tells someone he owns a race car. Not quite. He’s driving the car. Weyland (B.B.A. ’60) races professionally in the American Le Mans series, regarded as one of the world’s leading prototype and GT endurance circuits. 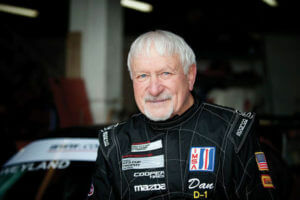 He’s been circling the tracks for 18 years, all thanks to a spontaneous purchase of a race car he made when he was 55. A little grayer — OK, considerably grayer — than the competition, Weyland laughs off the disbelief over his hobby. Weyland recently competed on one of the sport’s biggest stages, racing before an international audience of nearly 120,000 in November 2012 in the Pirelli GT3 Cup Trophy USA West, a support event at the Formula 1 US Grand Prix weekend at the new Circuit of the Americas in Austin. Driving a bright orange car with a large St. Mary’s University decal covering the driver’s-side door, Weyland knows the crowd probably didn’t expect someone of his age to be inside the car. Weyland made most of his living in real estate development, having specialized in developing medical office buildings in Houston before moving to Denver, where he now lives. He is president of Weyland Enterprises and MedPro Management, and he also founded the WECANDO Foundation, which supports charities in the Denver area. Despite his busy career, Weyland still found himself looking for new hobbies later in life. Enter racing. A lifelong sports fan who grew up in San Antonio playing basketball, baseball and football, Weyland never shied away from a competitive challenge. He later picked up tennis and skiing and always admired racing from afar. “It was the only sport that I watched that I didn’t understand,” Weyland said. Eager to change that, Weyland, 55 at the time, signed up for a racing lesson in hopes of learning the nuances of the craft. He figured he’d learn a little about technique and mechanics — just enough to make watching the sport more enjoyable. But by the time the session was over, he had purchased the car and the license to go with it. Just like that, he was ready to race. “It was instantaneous,” Weyland said of falling in love with racing. Weyland knows some people might think he’s eccentric, or just a daredevil. But while he enjoys the speed of a race, it’s the camaraderie with his crew and the other drivers that keeps him going. Dan Weyland, a graduate of the St. Mary’s University Business School, prepares to race. As such, Weyland has become an ambassador of sorts for the sport – and on how to live life. Following months of preparation and excitement heading into the November Grand Prix race — one of the few times he has raced in Texas – Weyland strapped into his car and took off from the starting line. But heading for the second turn of the opening lap, his engine began to fail, leaving Weyland facing the distinct possibility his day would end mere minutes after it started. Something had triggered a built-in safety feature to kick in, shutting off the engine. While Weyland never expected to win the race, the breakdown nixed his chance to remain competitive at all. Weyland was, in the end, last to cross the finish line. “I was actually in good shape until the engine stopped,” said Weyland, who included the St. Mary’s logo on his car in honor of a place that remains close to his heart after receiving his marketing degree in 1960. Which is why his temporary engine failure was all but irrelevant in the end.